A cruise on Bateau-Mouche is a must when visiting Old Montreal. Whether you are on the main deck, the upper deck or on the beautiful terrace, Bateau-Mouche’s lustrous environment will charm you. The guided 60 or 90-minute day tours will give you a well-deserved break. Hotel pick-up and drop-off are not included: you will meet your guide at the Jacques-Cartier Pier. Snacks and bar service will be available for purchase on board at additional costs. 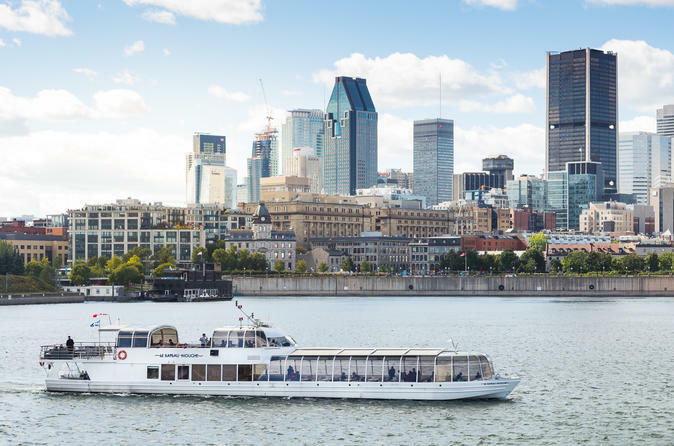 Meet for this cruise along the water at Jacques-Cartier Pier in the Old Port of Montreal. You can pick from four different departure times, so depending on which time you choose, make sure to show up about 30 minutes before that time. Boarding is 15 minutes prior to the departure of time, and seating is on a first-come-first-serve basis. Please note that Bateau-Mouche is a smoke-free environment. Bateau-Mouche offers exclusive tours on water inaccessible to other boats. Moreover, thanks to its flat bottom, Bateau-Mouche allows for smooth sailing, bringing you closer to the splendor of the St. Lawrence River and its coastline. Enjoy panoramic views of the Olympic Stadium, Clock Tower, Biosphère, Jacques Cartier Bridge, and Habitat 67. This cruise is guided by a local guide who tells you interesting facts along the way. Snacks and bar service are also available on board (additional costs). After your boat cruise, get dropped back off at the Pier with the rest of the day to enjoy even more Montreal.